A small animal (fox? wolf?) poses in the foreground—calm, contemplative, almost human (watching carefully you detect feet, bare, sunk in golden grass). An autumn tree stands behind it. Does it sprout from its head, unicorn-wise? Other trees, silhouetted in black, draw a window through which the background explodes—a patchwork of sky, billowing clouds, mountaintops floating in a mist of turquoise. Is it nighttime? The darkness of the framing vegetation suggests it, but the air as well as the center subject are luminous. In the front, level with the pensive creature, rock formations spread towards the right and left—a pair of offering hands. Plant and animal form a letter S, the mark of infinity. The book cover captures main features of the text with unusual syntony. It suggests a tendency for metaphors to drift into metamorphosis—humanity irresistibly melting within landscape, trying to escape bodily constrictions, gravitating towards a more congenial status of openness and reflection. It states the centrality of the tree-symbol, its likeness with the ladder of the title. Lois P. Jones’ collection of poems (many of them previously published in journals and anthologies, some of them award winners) is divided in five sections, with one loose beginning. “Rilke’s Bayon” precedes pagination, stands before the Contents—a sort of summary itself. An accompanying photograph shows the enormous tree Rilke saw in a Cambodian temple, roots diving into earth, trunk reaching over stones. Here the author affirms the tree-ladder equivalence, also giving the reader a key she should keep at hand—the climb is reversible, simultaneously ascending and descending. The poem also introduces one of the friends, mentors, Virgils, Jones will bring along for the journey. Rilke and Lorca are present throughout the book, acknowledged here and there, though the author never ceases engaging them in quiet conversation. They are not alone. Epigraphs and dedications (to artists, writers, and to specific works) parse the pages. They are light traces, not burdening in the least. On the contrary, evoking a wider context and a sense of spiritual communality. Tying a tapestry of resonances—an intricate, beautiful prayer rug. Don’t expect a series of disincarnate meditations. The epigraph of chapter one mentions “red.” Colors here are sharp and lively—pictorial sensibility a given, a few pieces directly responding to art (by Picasso or Da Vinci, as well as by living artists). Yet red doubtlessly dominates—”the color of sin,” says the quote. Color of love and death. Eros and Thanatos alternate through the pages. They take turns under the limelight, freely segueing. You can hear them—two powerful voices in a fugue, unafraid of challenging stretti. You can see them run up and down the rungs, now leading, now following—and you realize the ladder is spiraling, a strand of DNA perched into space. Love and death attempt to claim the book for themselves, sometimes pulling in opposite ways, often intermingling. None of them ever wins but their display of talent is thrilling. The author knows them well, yet she knows much more. I mentioned metamorphosis. It occurs in a myriad of fractal episodes—everything in constant state of becoming. Metaphor, of course, does it. 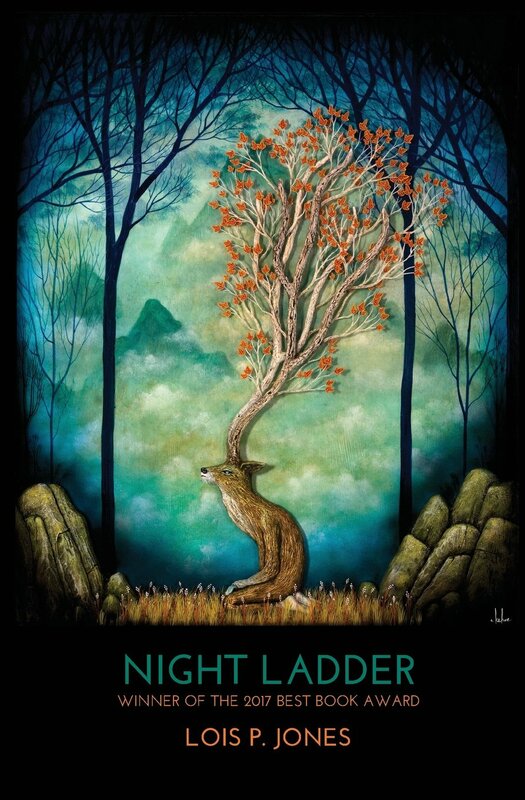 As the ladder goes up and down, Jones’ metaphors are two-fold, animating the natural world and “naturing” humanity. You’ll find “eyes that migrates in winter,” “pale knees crossed like driftwoods,” “hand a frozen river,” or “the delicate walk that holds a city in the body.” But you’ll also notice a book is “a hinged bird turned cold,” “mountains repeat themselves like old people,” or “return from where they have wandered in the night.” Do the self and the world reciprocally decipher through metaphor? Clearly so, and the impression is fostered by the use of inverse point of view, as it happens when the chestnut tree out of the window tells Anna Frank’s story, when Da Vinci’s “Scapigliata” is described by the mirror, when the quiet young maid, Leni, articulates Rilke. Metaphor is so rich, in Jones’ poetry, it can’t be isolated. Every thing and being breath together—Lorca’s duende unifies it all. Metaphor/metamorphosis also characterizes love poems, often choosing imagery of fruit, enhancing sensuality. Love is brief encounters and foreign locations—traveling fosters sensorial alertness wherein Eros thrives, allows freedom and exacerbates urgency. In Jones’ poems love is fugitive, with “the breath and the scent of things impossible to keep.” Love, at its very essence, is impermanence. This last is also a recurring theme. The kaleidoscope symbolizes it, with its own dedicated poem, and its companion icons such as aurora borealis, planets painted on postcards to Samsara, even the fireworks bursting on the fourth of July—birthday of a nation and of the author herself. In these circular universes forms are endlessly destroyed and reborn—same mosaic beads drawing an incessantly shifting design. Nothing is lost but nothing stays the same. The instant of combustion is a bright epiphany, which of course doesn’t last and goes easily unwitnessed—unless. Even the self is impermanent in “Self Portrait”, as death is in the very last poem—scattered in a flight of dogwood petals. Death is never tragic, never too sad. In a few poems themed after the Holocaust, Nazism, Jewishness, it circulates like a question, like a drone in the background. It grieves Lorca’s execution, ponders the meaning of last rites, the eventuality of return, the hardship of staying. It hides into the title poem, dedicated to Borges. A blind man at midnight (the hour when everybody is blind) climbs the stairs to the top and imagines the cracked, crumbled concrete of the tavern below. And you wonder what fell there, to cause those scars. Yet death isn’t tragic as it isn’t final, we said. Nothing is if the ladder—we understand—is a loop, a ride bringing you around. Let me mention those spots where your foot extends and finds nothing—just holes between rungs. You can call them suspensions. Stillness, if you prefer. You don’t meet them often, and are not supposed to. Something of the kind exists in all works of art, and this collection is one such. A few poems punctuate and rupture the flow. They are made of different substance, neither more nor less valuable. Other. The impression for the reader is of losing her grip, body hazardously launched into a dazzling void—reminding, indeed, of the lit background seen on the cover picture. Instead, she might feel the shock of higher density—a sudden, irreversible landing. Those poems, “Foal,” “Shema,” “Lazarus” among others, are netless trapeze evolutions Jones effortlessly and fearlessly perform. How can she? She has been climbing for so very long, up and down, all the way. Until the steps, suddenly, disappear.